I am a bit afraid that it may be a very silly question, but in this position (3 stones handicap), is any one of a-d clearly better then the other ones or are they simply different games? unkx80: Are you referring to or ? iff I am interested in the next move for white ( ). I thought that maybe there is some sort of difference (with regard to corner-coordination, urgency of approaching a san-ren-sai or whatever) that would make one move be a little bit better than the rest (a la the "move 2 lost the game" dictum in TheDirectionOfPlay). My answer for both and is that all of a, b, c, d look equally good for me, just different games. can also consider playing at e, just more aggressive, that's all. kokiri if white plays on the star point, i'll pretty much always preserve the symmetry by playing at f. it's probably less workable than other moves, but it seems to lead to interesting games. Benjamin Teuber: I'd play d without hesitation, but of course it's a matter of style. Klaus: What about this? 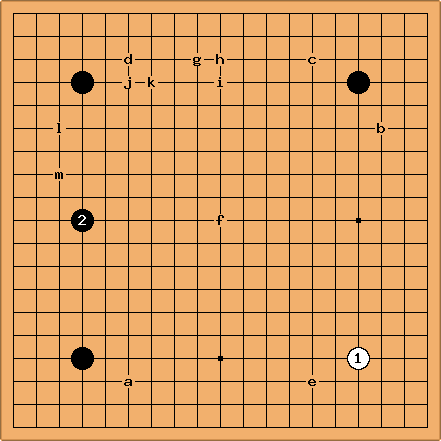 A classical wedge enables white to open a second stable fighting unit. Kushi: How to answer 4 then? The top stone will live, making the area uninteresting for black. 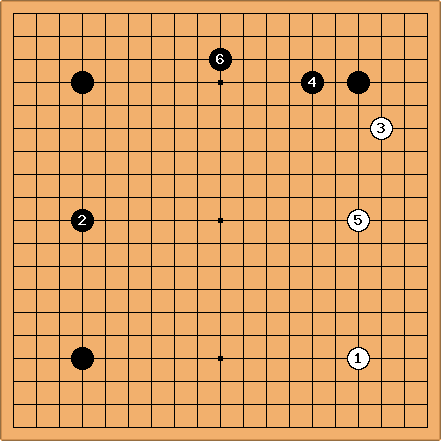 But with 4 black has made a big moyo, and is poised to make profit from an attack on either 1 or 3. Klaus: Personally, I don't like situations like this, because white needs a second stable group, but it won't be easy to find a good place for it. Dieter: A handicap game is too easy for Black. That's the paradox about handicap go. It's usually considered bad attitude to count on your opponent's mistakes but in a handicap game you have to rely on them (outnumbering your own). The proper way to play small handicap Go is building stable groups, try to overconcentrate his position and only slightly overstretch your own, and win a lot of points in the endgame. Depends on style too. Here the san-ren-sei is certainly invadable: you may not like it but usually Black doesn't like it either to be invaded by a stronger player. Jesse: I might try a high wedge, and then if Black replies at the top, tenuki to approach at a. Bill: As Dieter says, in a handicap game you have to count on your opponent's mistakes. In theory, all plays by White lose, and playing for the smallest loss is not very dynamic. ;-) Also, psychology enters into it: What plays fit your style, what plays give your opponent trouble? In the original diagram, among a, b, c, and d, IMO b is theoretically best. 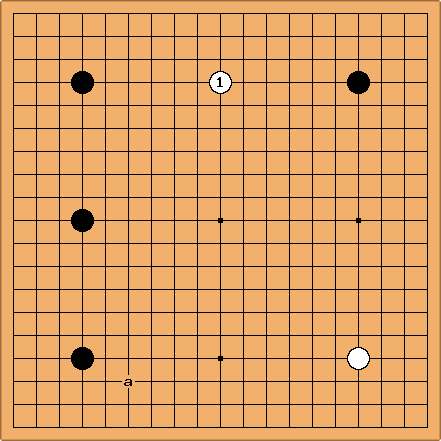 It is better than c because c invites a Black pincer, which works well with Black's stones on the left. 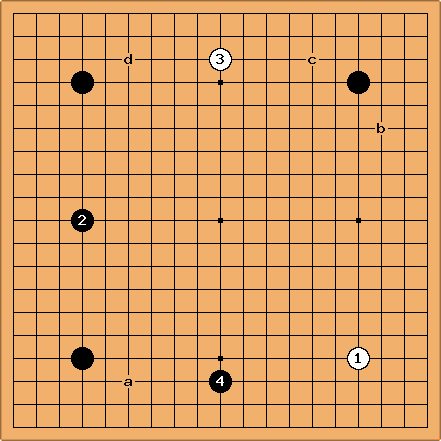 b also works with , as does a. b is better than a because Black has a local advantage with . Again, we can expect a pincer, weakening the relation between a and . d is worse than c, even though we expect a pincer in either case, because of . Better than all of them, I think, is a wedge at g, h, or i. No pincer, and it hinders Black's development. I would not fault anyone for playing it. In a handicap game I go for d, j, or k, because a wedge is too easygoing for me. I would not fault anyone for playing at l or m, but I am not that aggressive.